The following is a guest post from Tammy Logan of Gippsland Unwrapped. She lives on a farm, is a mother, a passionate eco-warrior and has a degree in conservation biology. After completing Plastic Free July Tammy realised that she did have a choice about how she lived her life or voted with her dollar. And so, Gippsland Unwrapped was born. It's a blog about living a life that leaves less of an impact on the world. What exactly does it mean to live plastic free and zero waste? Plastic free living is about eliminating single-use and semi disposable plastic items from your life e.g. straws, water bottles, bags, coffee cups, toothbrushes, razors, and most packaging. The term 'plastic free living' is a little misleading because people often think it means living without plastic altogether and this may not be possible in today's world. To me a plastic free lifestyle is a protest against the misuse of plastic – a material that is designed to last forever but is used and thrown away in minutes! You can still own a phone, laptop, car, and take your medication but you should continue to monitor your use of these items to manage resources less wastefully. People who become committed to a plastic free lifestyle also tend to weed out other plastic items in their lives over time. For example, clothing made from natural materials like hemp and wool will be chosen over polyester fabric. Living zero waste can be defined as diverting 90% of your own rubbish from landfill (the remaining 10% accounts for the unavoidable stuff). Rubbish is the stuff which cannot be reused or recycled. However, this does not mean you should consume plastic and large volumes of recyclables just because they can be recycled. Recycling does not adequately address waste related issues and uses large amounts of resources, so it's a last resort for zero wasters. I'm still trying to determine where the goal of 90% reduced landfill originated from, but I don't think it matters. Like plastic free living, I see zero waste living as a protest against a throw-away society. It's a demonstration that we don't have to tolerate mindless consumption or the environmental, health and social ramifications. Striving for zero waste is a way of changing attitudes towards consumerism and our shared resources to create a better system. I believe you can call yourself a zero waster if you are constantly trying to be the change. 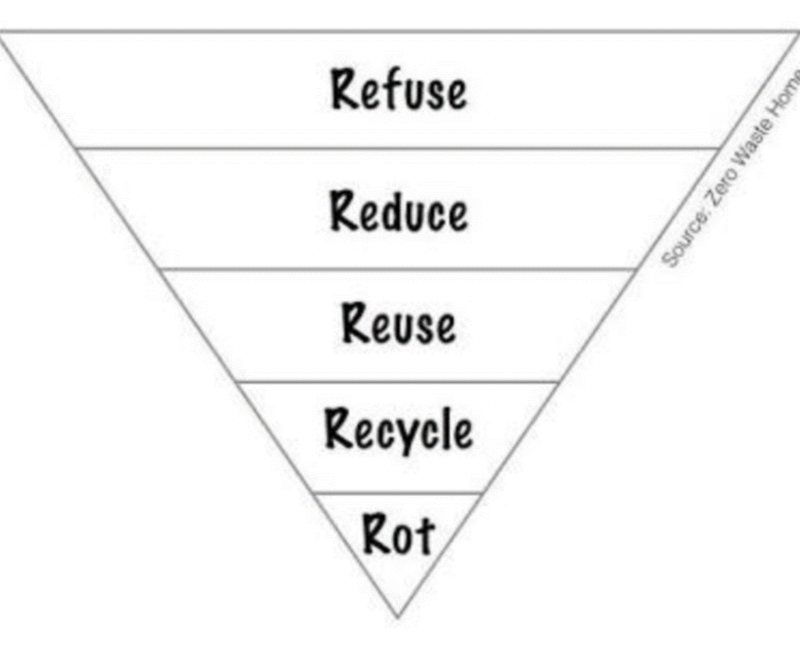 It doesn't matter if you have a waste bin or not, as long as you consume and use resources mindfully and intentionally. 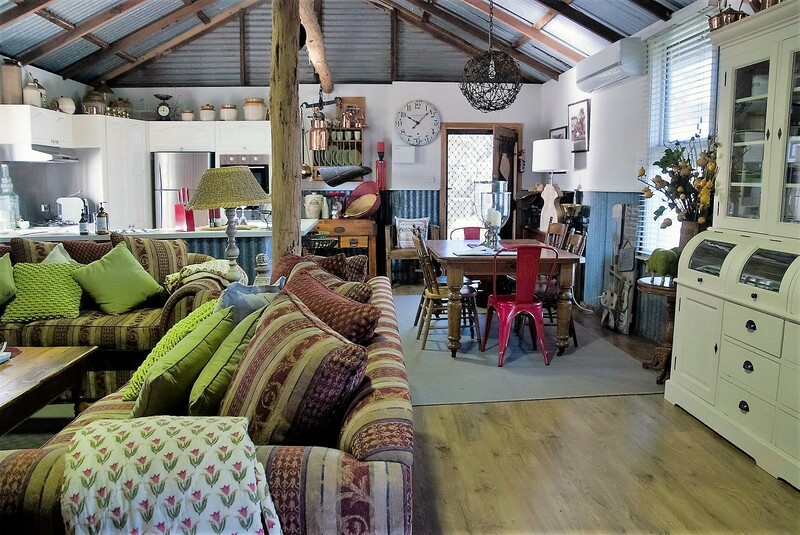 Above: An old shearing shed converted into a plastic free haven. The Buyerachy of Needs is a schematic for consumption. It was made by illustrator Sarah Lazarovic and is based on Maslow's hierarchy of needs (a theory for what motivates people). The idea behind the schematic is that you should not buy anything until you have exhausted all other options in the pyramid first. Why is The Buyerachy of Needs important for plastic free or zero waste living? It's simple. By finding ways to buy less, you create less waste. 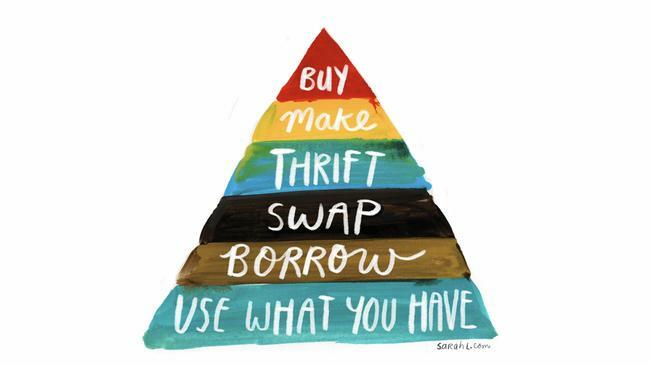 By focusing on what you have already, the more value you place on items for reusability, and in turn, the less you need to buy new or secondhand (thrift). Buying less can mean saving money and not choosing the cheap plastic option. There are lots of ways to make do if we give it a moments' thought. I love how The Buyerachy of Needs encourages creativity and resourcefulness. These skills are key to innovation and a bright future. I grew up learning about the 3 Rs: Reduce, Reuse, Recycle. Over time different organisations and people have added or replaced various R words like repair and repurpose. I tend to categorise those words with reuse. I like the 5 Rs model because it takes a strong stance by saying we should refuse anything we don't need. Significant amounts of resources are used to make things, so we need to stop mindless consumption. Reduce becomes about recognising that some things are difficult to refuse completely but we can often reduce how much of it we consume. Reuse is the next best thing we can do with an item to prevent waste. This might include repairing it or repurposing, or even swapping it for someone else to reuse. Note that recycling is the second last option for dealing with waste. Whilst it diverts items from landfill and the litter stream, it uses large amounts of resources. If you are finding it difficult to know what is recyclable, or inconvenient to recycle something in your area, you will find that recycling becomes a whole lot easier when there is virtually nothing to recycle because you have been refusing and reusing. Rot refers to composting. Anything organic is compostable. If you start a compost heap or are able to feed food scraps to animals, you are well on your way to eliminating your need for a bin liner and your household waste will go down by about 40% – that's how much kitchen waste authorities believe to be in our garbage. By dealing with organic waste separately you can reduce contamination issues and production of greenhouse gases, and help stop landfill sites from filling up too quickly. You may have had heard that it takes 21 days to change a behaviour. It turns out that this is the minimum amount of time required and it can actually take up to 254 days to change a behaviour. The research shows that on average a new behaviour becomes automatic after 66 days (2 months). It also shows that you can make mistakes occasionally without having a detrimental impact on the long term habit you are trying to establish – that's a good thing! So remember behaviour change is a process that is different for everyone. Give yourself permission to make mistakes and get back on track. If you keep forgetting your reusable shopping bags, think of strategies to make it easier until it does become automatic. I'm a bit of a planner and a list person so one of the first things I did was make an action plan. I've included a template here for you to use. Step 1: Take this table to each room in your house and list all the products or items you consume in the first column. Step 2: In the second column, if you can't live without something, list the plastic free or zero waste alternative. If you don't know an alternative, leave it blank until you can do some more research. Step 3: Use the third column as a way to quickly note which things you can easily obtain in your regular grocery shopping and which things might require learning/time to make, or shopping at a different place. Step 4: Next have a think about the barriers which might stop you from making the change. Write down how you will deal with this. For example, if you want to remove your need for a bin liner but find composting unpleasant or inconvenient because you have to trudge to the back corner of the yard in Winter, then remove that barrier by finding a method of composting that is more to your liking and/or move your composting system to a more convenient location. Step 5: Finally, give all the quick and easy changes a priority 1 rating. Give the things that are a little bit harder to change a priority 2 rating, and everything that requires significant behaviour change, investment, or learning something new a priority 3 rating. Now begin implementing all your first priorities. This will enable you to get off to a great start! As you work your way through your second and third priorities, remember to go at a pace that feels right for you. You are not competing with anyone else and not everyone has access to the same support systems. You might want to try focusing on one change per week, fortnight or month. And remember to consider The Buyerachy of Needs and 5 Rs as you go through this process. For example, I am still using my plastic Tupperware containers because I had them already, they are reusable and it would be more wasteful for me to get rid of them and buy new containers. I'm sure there are more, but that's a pretty good list!